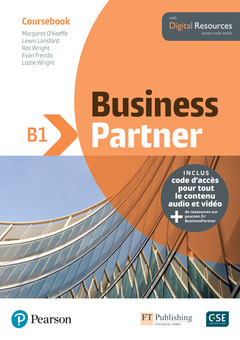 Discover the innovative world of Business Partner, a new eight-level business English course for learners and professionals who want to communicate effectively in English in the workplace. Partnering with the Financial Times means that this course also offers a wealth of international business information on a wide variety of topics. • Personalize your learning experience with a structured modular approach that gives the flexibility to focus on specific needs and learning outcomes. • Study real-life business stories provided through authentic videos that draw you in and keep you motivated. • Learn about key business topics such as Careers choices, Business Sectors, Projects, Global markets and Communication. • Immerse yourself in the integrated video-based Communication skills training programme to develop awareness of communication issues, including building rapport, dealing with interruptions, managing conversations, dealing with disagreement and responding to customer concerns. • Get practical training in functional business skills such as networking, selling a product, dealing with conflict and generating and presenting ideas. • Work on realistic case studies in the Business workshops. • Evaluate your progress step by step against the Global Scale of English Learning Objectives for Professional English. • Prepare for business English exams such as BEC, BULATS, LCCI and PTE Professional™. • Étudiants en école de commerce, LEA, ou tout étudiant ayant besoin d'améliorer son niveau d'anglais dans un but professionnel.